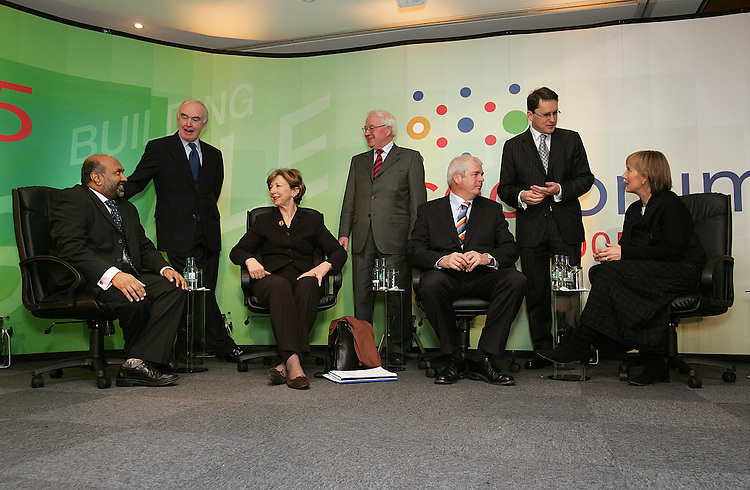 Raomal Perera, CEO, Valista (left) with Pat Molloy, Chairman, Enterprise Ireland, Olivia O'Leary, Master of Ceremonies, Pat Kenny, Managing Partner Deloitte, Ronan O'Caoimh, CEO, Trinity BioTech, George Lee, Chief Economist, RTE and Julie Sinnamon, Head of Corporate Development, Enterprise Ireland (right), pictured here at the CEO Forum 2005 entitled "Building Scale, the Global Challenge" held at the Leopardstown Pavillion, Dublin. Pic. Robbie Reynolds.